Edward Murrow observed, “[Churchill] mobilized the English language and sent it into battle,” and that's exactly what this film depicts: the power of persuasive writing, language, and oration. Virtually every scene features Churchill, his faithful secretary (Lily James), her trusty clickety-clackety typewriter, and a recurring ray of diagonal, natural sunlight that crowns Churchill's last remaining Yoda-wisps of white hair whilst he dictates the perfect, punchy sentence to convert adversaries into accomplices. He dictates from the bed, the loo, the den, the dining table, the hall, the backseat of the car, the top of the stairs, the foyer, the living room, the war room, the parliamentary antichamber. You name it, he dictates from it. If you love words, it's a gas! His wife (Kristin Scott Thomas) is wonderful. "Your life has prepared you for this," she encourages. "Your wisdom is tempered by your doubt; your passion by your hesitation. You are the ideal bugger for the job." When he is acerbic and curt to the younger staffers serving him, she chastises, saying, "With more power must come greater kindness and compassion," and when he nearly loses himself to the den of thieves and warpy, distorting gravitational pull of internal politics, she suggests, "Speak to the people; they'll remind you whom you serve." I think you'll also enjoy the unique dynamic between Churchill and King George VI, in whom the former confides, "I have very few relations in which I can be completely and utterly frank," to which the king replies, "Then perhaps now we have each other." 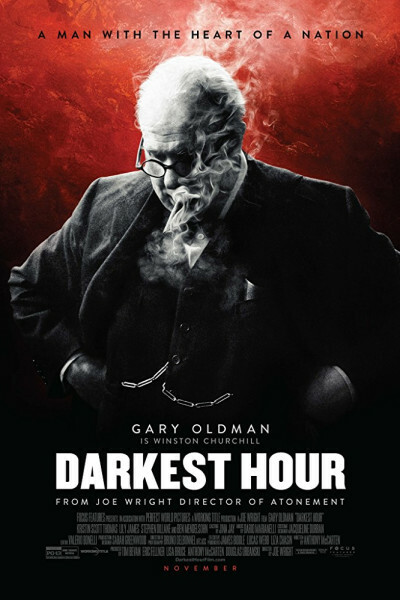 If you continue to suffer from symptoms of withdrawal following the departure of Downton Abbey, love Netflix's The Crown, or have fond memories of The Remains of the Day and its ilk, well, Darkest Hour will be your new catnip. I gawr-on-tee. Money in the bank. Just be sure and catch it, either now or on demand, as it has almost fully been pointy-elbowed out of theaters by the happy meal Star Wars juggernaut, and will soon be completely displaced by artsy arrivals like The Shape of Water, The Greatest Showman, Downsizing, Phantom Thread, Hostiles, The Post, All the Money in the World, Molly's Game, and I, Tonya. In fact, that icy stop-scrape you hear now is Tonya screeching into the theater next door.